Père Ubu first appeared in 1888 in a collaboration between Alfred Jarry and a fellow student at the Rennes Lycée, but his first public appearance came in 1893 when Jarry published some of prose works in an avant-garde review, the Minutes de Sable Mémorial. His triumph, however, was on the stage when the director of the Theâtre de l'Oeuvre, Lugne-Poe staged a production of Ubu Roi. The audience received the play with screams, whistles, fist-shaking, the critics took up the cudgels and the play became infamous and its author an avant-garde hero. A later work, Les Gestes et Opinions du Docteur Faustroll, Pataphysicien, launched a new science, Pataphysics, the "science of imaginary solutions," which was revived half a century or so later by an international group of writers including Raymond Queneau, author of, among many other works, Zazie dans le Métro, and counting Pierre Alechinsky, one of the founders of the COBRA group, as at least a fellow traveller. Ambroise Vollard was much taken with Ubu and enlisted Rouault (beginning c. 1918; first published 1932) to prepare illustrations to Vollard's own sequel to Ubu Roi, the Réincarnations de Père Ubu. After Rouault, Max Ernst, Picasso, and Réné Magritte all produced works illustrated the monstrous Ubu's monstrous deeds; Miró was also deeply committed to Père Ubu, illustrating three texts, Ubu Roi (1966), Ubu aux Baléares (1971), and L'Enfance d'Ubu (1975). As presented by Jarry, Père Ubu is a bully, an ingrate, a coward; Miró's Ubu is all of these but most of all a force for chaos. Jarry's Ubu is the exiled king of Aragon who has become Captain of Dragoons, aide to King Wenceslas, and bearer of the Order of the Red Eagle; he shows his gratitude by killing the King, the Queen, and all but one of the Royal family: he is always cursing, always plotting, always running away, and always abusing those weaker and even more cowardly than he. 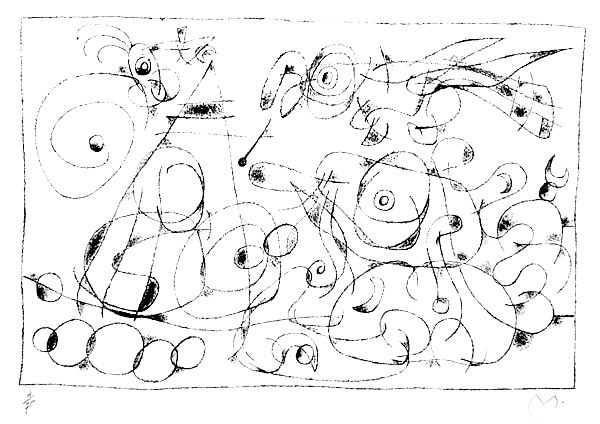 Miró's Ubu is always more or less incomprehensibly running about and running amuck. An English translation (edited by Simon Watson Taylor) of Jarry's Ubu plays was published by Grove Press in 1968. There is absolutely no difference in the lithographs in the HC portfolios or in the numbered portfolios. The only physical difference between the 75 signed and numbered color impressions and the 205 unsigned color impressions in the edition of 205 is that the 75 were printed on larger paper and have margins and were published in a larger portfolio and do not have centerfolds (there is also, needless to say, a very substantial difference in price between the signed and numbered color impressions on paper with large margins and the 205 impressions with centerfolds. We have 7 of the unsigned color impressions with centerfolds measuring 422x646mm priced at $2250 and 4 of the signed and numbered impressions printed from the black stone measuring 540x740mm priced at $8100 (including number VIII and X). Ubu Roi I (M462). 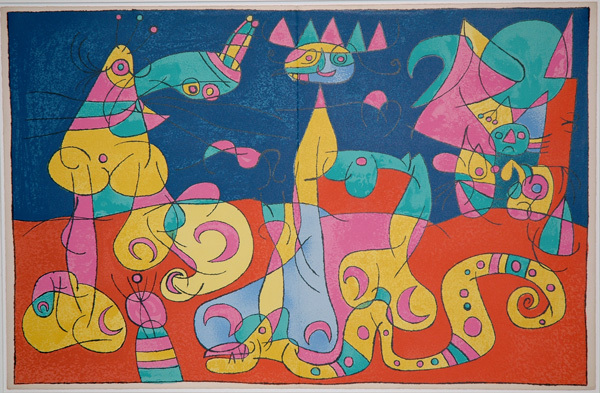 Original color lithograph, 1966. 205 unsigned impressions (of which ours is one) on Arches paper printed by Mourlot and published by Teriade. There were also 75 black and white impressions signed with Miró's initial and 75 pencil-signed impressions, both with large margins. In this work, Miró revisits his early and important Barcelona series, executed during World War II as a protest against its savagery. Image size: 422x646mm. Price: SOLD. Ubu Roi II (M465). Original color lithograph, 1966. 205 unsigned impressions (of which ours is one) on Arches paper printed by Mourlot and published by Teriade. There were also 75 black and white impressions signed with Miró's initial and 75 pencil-signed impressions, both with large margins. 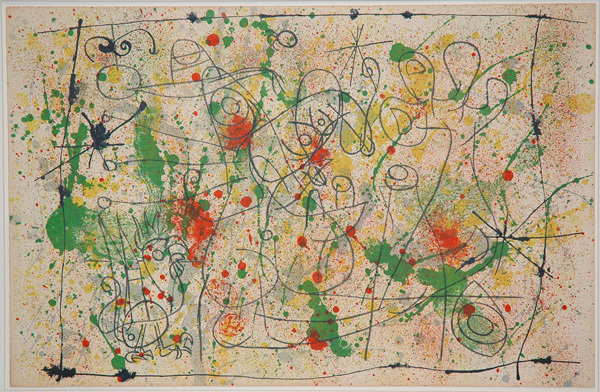 In this work, Miró revisits his early and important Barcelona series, executed during World War II as a protest against its savagery. Image size: 422x646mm. Price: SOLD. Ubu Roi III (M468). 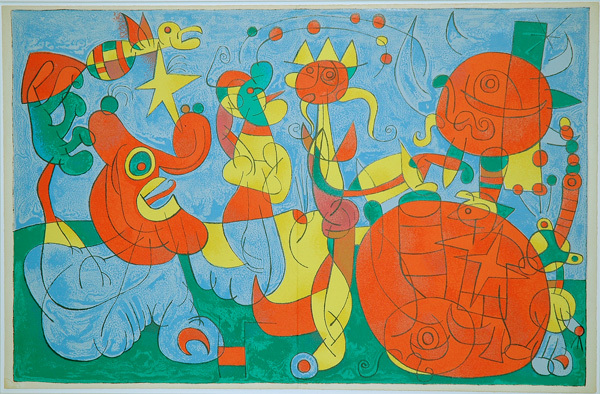 Original color lithograph, 1966. 205 unsigned impressions (of which ours is one) on Arches paper printed by Mourlot and published by Teriade. 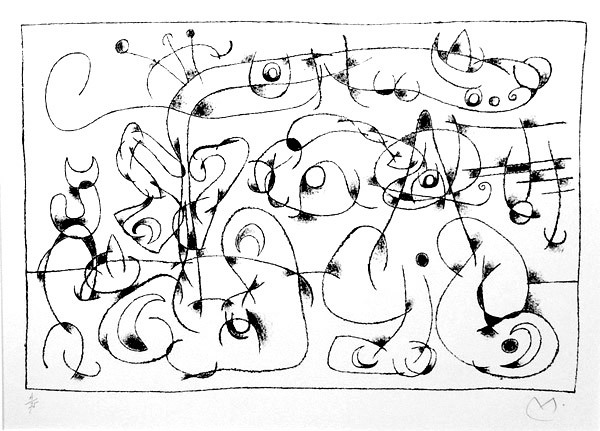 There were also 75 black and white impressions signed with Miró's initial and 75 pencil-signed impressions, both with large margins. In this work, Miró revisits his early and important Barcelona series, executed during World War II as a protest against its savagery. Image size: 422x646mm. Price: $3250. Ubu Roi IV (M471). 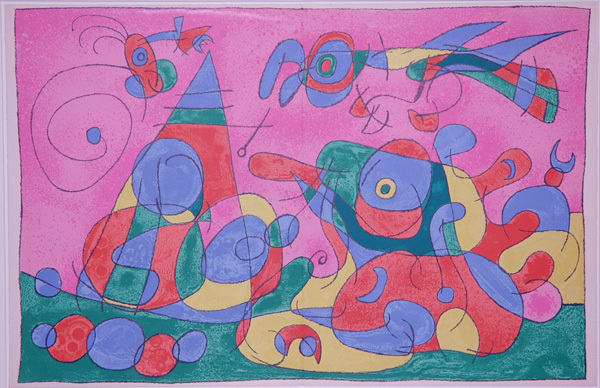 Original color lithograph, 1966. 205 unsigned impressions (of which ours is one) on Arches paper printed by Mourlot and published by Teriade. 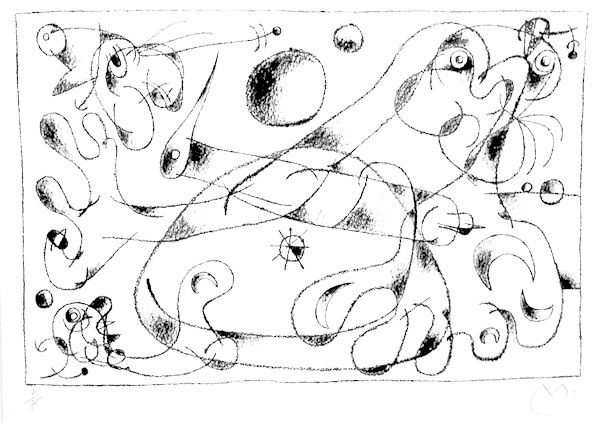 There were also 75 black and white impressions signed with Miró's initial and 75 pencil-signed impressions, both with large margins. In this work, Miró revisits his early and important Barcelona series, executed during World War II as a protest against its savagery. Image size: 422x646mm. Price: SOLD. Ubu Roi VI (M475). Original lithograph, 1966. 75 initialed & numbered impressions. In this work, Miró revisits his early and important Barcelona series, executed during World War II as a protest against its savagery. Image size: 540x740mm. Price: $8100. Ubu Roi VI (M477). 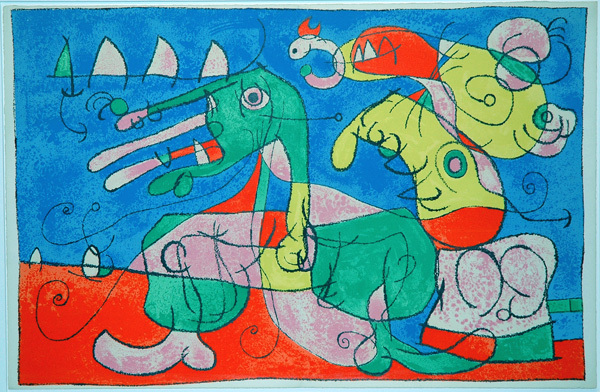 Original color lithograph, 1966. 205 unsigned impressions (of which ours is one) on Arches paper printed by Mourlot and published by Teriade. There were also 75 black and white impressions signed with Miró's initial and 75 pencil-signed impressions, both with large margins. In this work, Miró revisits his early and important Barcelona series, executed during World War II as a protest against its savagery. Image size: 422x646mm. Price: $3250. Ubu Roi VIII (M481). Original lithograph, 1966. 75 initialed & numbered impressions. In this work, Miró revisits his early and important Barcelona series, executed during World War II as a protest against its savagery. Image size: 540x740mm. Price: $8100. Ubu Roi VIII (M483). 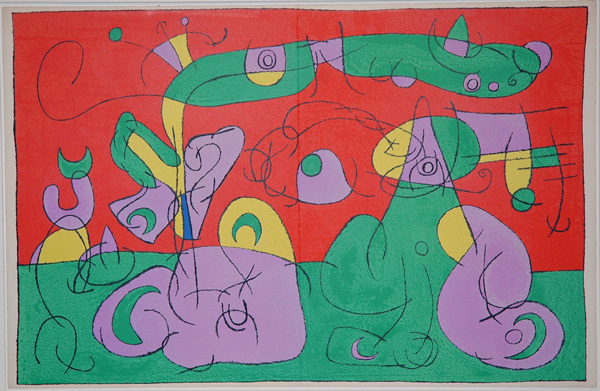 Original color lithograph, 1966. 205 unsigned impressions (of which ours is one) on Arches paper printed by Mourlot and published by Teriade. There were also 75 black and white impressions signed with Miró's initial and 75 pencil-signed impressions, both with large margins. 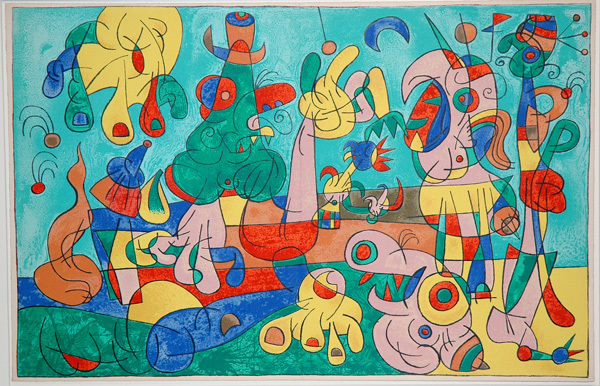 In this work, Miró revisits his early and important Barcelona series, executed during World War II as a protest against its savagery. Image size: 422x646mm. Price: SOLD. Ubu Roi IX (M484). 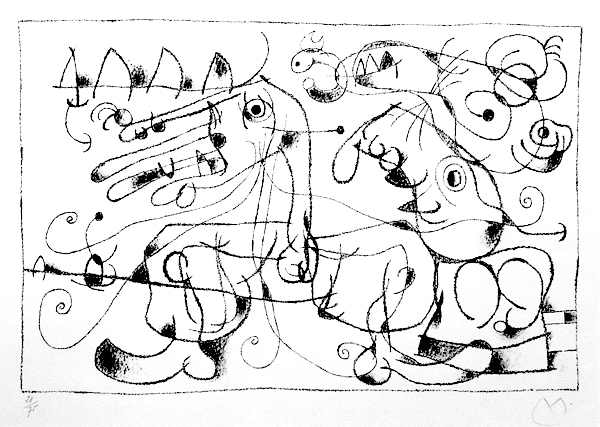 Original lithograph, 1966. 75 initialed & numbered impressions. In this work, Miró revisits his early and important Barcelona series, executed during World War II as a protest against its savagery. Image size: 540x740mm. Price: $8100. The blacks in this piece are as dark as the blacks in the pieces above. Ubu Roi IX (M486). Original color lithograph, 1966. 205 unsigned impressions (of which ours is one) on Arches paper printed by Mourlot and published by Teriade. There were also 75 black and white impressions signed with Miró's initial and 75 pencil-signed impressions, both with large margins. In this work, Miró revisits his early and important Barcelona series, executed during World War II as a protest against its savagery. Image size: 422x646mm. Price: $3250. Ubu Roi X (M487). Original lithograph, 1966. 75 initialed & numbered impressions. In this work, Miró revisits his early and important Barcelona series, executed during World War II as a protest against its savagery. Image size: 540x740mm. Price: $8100.